Karen Gomez opens the doors to the little florist boutique with a huge smile. She welcomes me into her family’s second home and leads me passed the quaint client meeting area, into the back work station. Gomez introduces me to her mother and I hand them the cups of Dunkin coffee. Both women give a little squeal of delight and we chat formalities for a while. A long table sits in the middle of the room and long, vase-stacked shelves line the walls. Ribbon, flower snips, pruners and various decorating items are placed neatly on the table. A tall, thin vase rests in the middle of the table with one or two flowers settled in it. Suddenly aware of how little I know of the art, I notice a walk in freezer in the back of the room and my inability to recall a name of the flowers in the middle of the table. I rack my memory for any trace of the name, but fail miserably. My attention goes back to the conversation and I give my inspiration behind the website and why I reached out to Gomez. She dives right into the story of the shop and her journey. “I graduated from NYIT and was fortunate enough to be able to work right away. I was very excited about the potential of what I could design.” Gomez is an architect working out of New York City. She spent years at NYIT powering through all-nighters, battling through insane projects and hours of scouring text books. “It was rough. You start off with maybe 200 kids in your class and maybe a quarter of them make it to graduation. I had to pull all-nighters, which I have always been against, but you have to do what you have to do.” She looks down and wrings her hands before asking me if I was cold. The room temperature feels near that of the outside New York, winter temperatures. I shrug her question off and shift in my chair, thanking a higher power I decided to wear long sleeves. “The room has to be cold to help keep the flowers fresh,” she laughs, probably noticing me awkwardly deny my goosebumps. We both laugh and I grab my notebook to help capture her story. “When I mentioned my plans to my guidance counselor, she told me I couldn’t do it because my math grades weren’t good enough. I went home and told my mom to get me a tutor!” Gomez pushed through 5 years of classes, the death of her grandmother, living in NYC and the piles of math equations and projects to graduate. She found a job with an architecture firm and has been there since. Like many jobs, the excitement wears away and the mundane sets in. “I am grateful for the position and to have a job, but it has become a lot of copy and paste. The same over and over again. That’s the job though.” She turns to the floral arrangements as a creative outlet. Her mother happened to hear of the opportunity to buy a florist shop from a client a few years ago. Before they knew it, they were owners of Bow and Rose, meeting with brides to-be, and making a mark on the Port Chester (New York) community. “This has become my creative outlet. I come here on my days off and help with clients and the arranging. We don’t want to be the cookie cutter florist that recreates arrangements from Pinterest. I want to create arrangements that people WANT to pin.” She takes a sip of the iced coffee and introduces me to her dad, as he walks into the studio. Her entire family has embraced this art form without any prior knowledge. They have dedicated themselves to the creation of beautiful arrangements and the care and quality of a living art. Dealing with the growers personally and studying hundreds of different species of flowers, Gomez has helped develop an environment comfortable for clients and a product unmatched to the beholder. I question to myself her ability to drink iced coffee in the cold room and ask her to show me some arrangements. Her face lights up and she offers to build one in front of me. She leads me to the other side of the studio where the afternoon sun is brilliantly shining through the windows. She collects all of her tools and I begin to assemble my camera. client wants or needs, dictates the artist’s parameters. Gomez decides to create an arrangement with some ‘edge’ to it and picks a few brightly colored flowers in different shades of orange. “Most brides stick to the classic peach, white and blush. Which is totally fine and pretty. I just don’t often get to do something different.” She describes a photoshoot she had done for the shop where she created a gown made of flowers and chicken wire. Gorgeous greenery and roses were woven together, creating an avant garde, living-art fashion piece. It was this photoshoot that drew my attention to interview her. “ I would love to do something like that again.” She begins by setting up a cylindrical vase and placing some curly willow branches neatly inside. “I like to start with a nest of some sort for the flowers to settle in.” She methodically and artfully places the willow into the vase, twisting them slightly one way, then the other, until they lay just right. The Mink Protea, a strong and unique flower, is the first to be placed in the nest. This bold flower originates in Africa and is often used as a symbol for family and strength. 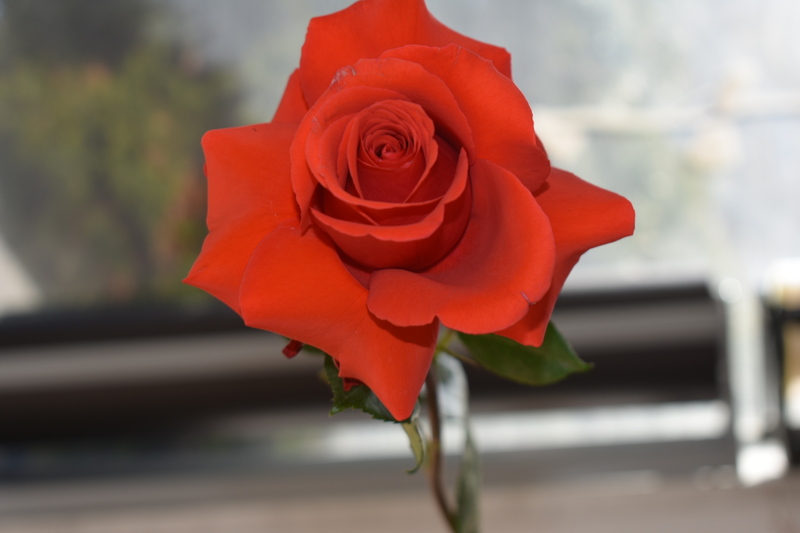 Bow and Rose often uses this flower in arrangements for brides that are missing the patriarch or matriarch of the family. Gomez then reaches for a brightly colored rose and starts to fold back the petals. “This is called ‘reflexing.’ It helps the flowers pop and look fuller. This rose is a Free Spirit Rose.” She then begins to place them in a patterned-but-random fashion amongst other beautifully colored Nina Roses. “I swear they react to energy. When things are hectic or I’m arguing with my brother, I swear the flowers start to wilt!” I laugh and shift my position to get better light. The 4:00pm sun is shining directly into the studio creating some funky shadows I try to capture. Gomez places each rose with purpose into an intricate, perfectly asymmetric arrangement. She finishes up by pointing the Mink Protea directly at my camera lens. “He’s staring at you,” she laughs. “The Protea is definitely a ‘he’. I like to give them genders. It just kinda fits the type of flower.” I giggle and zoom my lens right into his uniquely gorgeous face. This entry was posted in featured artists and tagged arquiflora, female artists, florist in westchester, florists, flower art, flowers, modern art, New York, New York Art, Westchester, westchester art. Bookmark the permalink.